Join us on Thursday February 9, 2017 from 8 p.m. to 12 a.m for the launch party of Women Abuv Ground (WAG) and Men Abuv Ground (MAG) at the historic Casa Vertigo in Los Angeles. WAG and MAG are new, professional networking organization, dedicated to educating and empowering people of color in the emerging cannabis industry. The CannaCool Lounge will feature cannabis-infused food and drinks from renowned chefs and tastemakers, a fashionable CannaCatwalk runway show, live performances, and vendors, showcasing the latest in cannabis-related products. Also, leading activists will be speaking throughout the evening to give attendees a first look at what it will mean for legal marijuana use in California and how to best benefit from the new law. In conjunction with awards season, this Hollywood event will be one of the first to celebrate the anticipated passing of California’s Prop 64, which legalizes recreational marijuana for adults 21 and over. 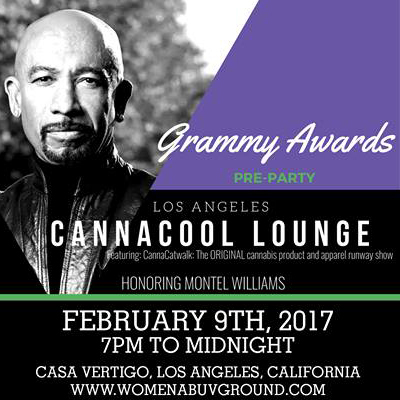 The launch of CannaCool Lounge is sponsored by *Montel William with LenitivLabs, Melissa Etheridge with Know Label, Marvin Washington with Isodiol, Dama Tequila, incrEdibles, Dope Magazine, To Whom It May Chocolates, Undoo, CannaClear Extracts, Privee Social Club presenting Bliss Edibles. *About the CannaCool Lounge The CannaCool Lounge is a signature, lifestyle gifting suite, offering cannabis connoisseurs a chance to explore new lifestyle, beauty and food products in the world of cannabis. Produced by cannapreneur Bonita “Bo” Money, the founder of WAG, the CannaCool Lounge is a high-end, celebrity-driven event, giving cannabis lovers an opportunity to enjoy the various offerings of marijuana. As a “purveyor of pot,” Bo is excited to present a cannabis-related event, offering an entertaining and glamorous environment to showcase cannabis products to celebrities, entertainers, athletes and industry tastemakers on a recreational level.